Jared Leto has credited his mother for his success, as she taught him to work hard to achieve his dreams. Jared Leto's mother taught him to "dream". The Dallas Buyers Club actor - whose parents divorced when he was young, with his father dying while he was still a child - credits his mom Constance for his success because she always encouraged him to do whatever he could to reach his goals. And Jared - whose performance in Dallas Buyers Club as transgender AIDS victim Rayon has seen him win a string of awards - has been accompanied to many ceremonies this year by his mother as a way of thanking her for her support. Speaking at the Academy Awards Nominees Luncheon at the Beverly Hilton Hotel in Beverly Hills yesterda, Jared - who is nominated for Best Supporting Actor - said: "We were born very poor and into pretty humble surroundings. My mother always wanted to do something better with her life and for her children. "She was a dreamer and a worker. The biggest lesson she taught me was to dream and then to do the work that it takes to make dreams a reality. It has been fun to bring her around. "The best part of these opportunities to stand up and say something is to be able to thank the people who have believed in you for so long. I could spend every single one of these events thanking my mother. She's the best." The 42-year-old star donned an eye-catching gold jacket for the occasion and admitted he likes to have "fun" with his wardrobe at formal events so he still feels like himself. 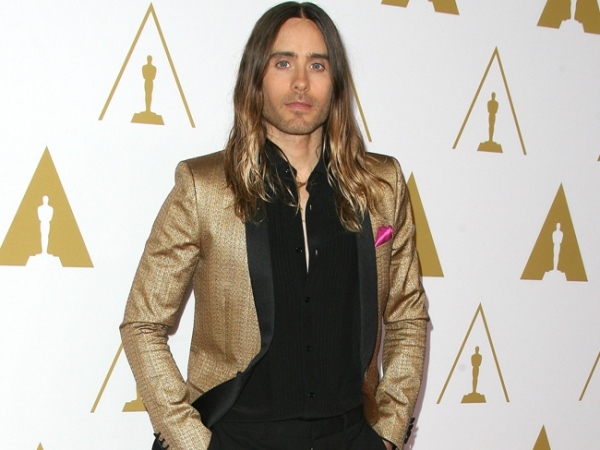 The 30 Seconds to Mars frontman added: "I don't dress up very much. I don't wear a lot of suits or sports jackets, but you have to have a little fun with it and you want to feel like yourself. Not like your agent."